At the beginning of winter, the days are shorter and it is dark longer. Ideal conditions for long-fingered, unnoticed persons to gain access to foreign apartments. This article describes how to protect yourself from burglars in winter time. Especially in the dark winter months, it is important to protect yourself as well as possible against burglars, because they are particularly active at this time. For burglars, it is especially easy to detect whether the apartment or home owners are at home or not, because of the early darkness. In addition, in the dark it is more difficult for thieves to be discovered by passers-by or neighbors – who are incidentally the robbers‘ biggest concern. Effective burglar protection does not start with a sophisticated alarm system, but with simple precautions that can be taken easily by any homeowner or apartment owner. Contrary to popular belief, burglars rarely strike during the night, but rather in the afternoon and evening. More than 20 percent of burglaries are committed between 6 and 8 pm. More than half of the registered burglaries occur between 4 and 10 pm. For this reason, you should illuminate parts of the house, for example, by using table or floor lamps with timers. You already deter many thieves through a bright entrance area. And do not worry: in times of LED lamps, there are no horrendous electricity costs in lighting during your absence. Windows as well as terrace and balcony doors are popular access points for burglars. 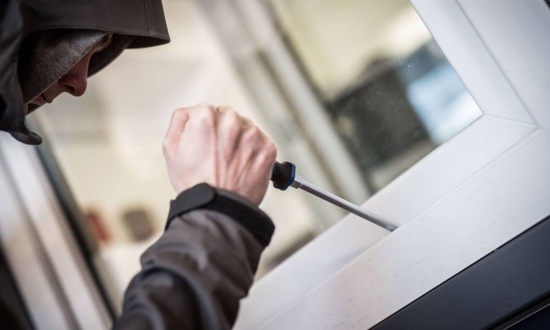 According to police statistics, 80 percent of burglaries occur in single-family homes and around half in multi-family dwellings through these “weak spots” of a property. Especially on the back side of buildings, doors or windows that are covered by hedges and shrubs provide increased danger of burglary. Therefore, you should always close the windows when you leave the apartment or the house – even if you just want to shop or do other errands. Even a tilted window is easier for a burglar to open than a closed one. Incidentally, most thieves do not gain access to an apartment through a window pane, but by levering the window frame from the hinge or lock side. About 75 percent of all burglaries are done this way. Even with terrace, balcony or entrance doors, a large screwdriver is enough to gain unauthorized access. In addition, close all climbing aids, such as ladders, garden furniture or garbage cans in a garden shed or the garage. This makes it difficult for thieves to enter higher floors. Daytime blinds signal your absence to thieves. Do not make things unnecessarily easy for burglars, and be sure to leave the blinds open at least during the day.